Now its time to practice some java programs. Here we provided some java interview programs and basic programs with solutions to practice. Java programming exercises for beginners and experienced programmers. 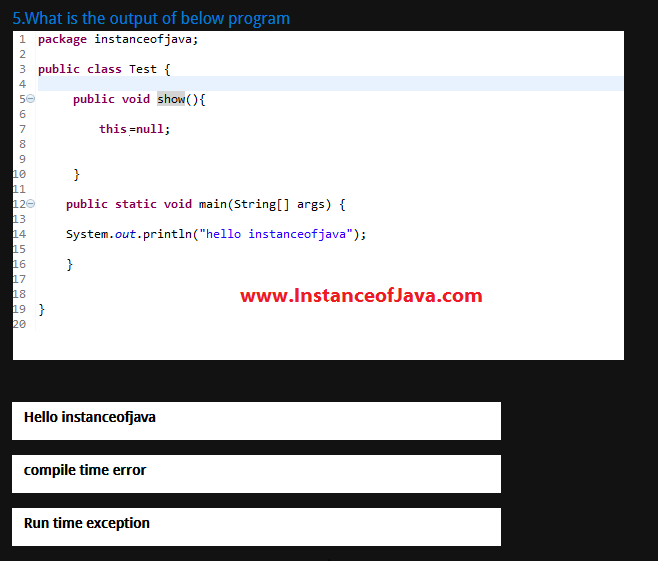 We have also provided some java multiple choice questions and answers. 1.Restricting a class from creating more than three objects. 2.Print message without using System.out.println() method. Can we print a message without using system.out.println() or System.out.print() methods. Yes we can. Check below java example program and practice it. 3.What happens when we try to print null? 9.Java Interview Programming questions on this keyword. Here we have provided some java programs and you need to find out the output of the program. Here we have provided 15 java interview programmings questions to practice for beginners and experienced. 11.Multiple choice interview programs and questions to practice. 16. Exception handling interview questions and programs.